Haven’t decided on a hotel yet? You can look at other available hotels in the counties of Northumberland, Durham, Tyne and Wear, and North Yorkshire with Booking.com. 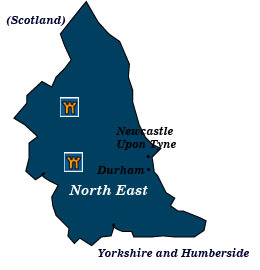 Too often people consider northeast England a burdensome distance on a map—an obstacle to drive through hurriedly on the way to Scotland. However for those who adopt a slower pace, the North East promises to reveal romance and history at every turn. Charming villages, historic abbeys, one of the most famous walls in the world, and dozens of castles (after all, this was once border territory between England and Scotland) have given rise to ballads and legends. You can find wide-open stretches of countryside and miles of broad sandy beaches to walk along. Durham The Normans first settled in this fascinating medieval city. From Durham Castle, the prince-bishops ruled the region for nearly 800 years and only left the castle in the 19th century when they handed it over to the one of the colleges of the University of Durham. The real masterpiece, however, is the Durham Cathedral, a UNESCO World Heritage Site. Constructed in the 11th century to hold the remains of St. Cuthbert, its grand Anglo-Norman Romanesque architecture and exquisite interior is nothing short of spectacular. Hadrian’s Wall Once marking the northern frontier of the Roman Empire, Hadrian’s Wall was built by Emperor Hadrian in AD 122 to keep the wild Scots on their side of the border. Stretching, more or less, some 73 miles from Wallsend in the east to Bowness-on-Solway in the west, the wall is now a UNESCO World Heritage Site. Special buses visit the wall, or you may ride a bicycle alongside, or walk the entire length on the Hadrian’s Wall Path. It wasn’t enough for the Romans to build a mere wall. A series of forts to house soldiers were spaced out along the wall. The best preserved one (and most popular) is Housesteads Roman Fort. Hexham Abbey In 671 a splendid Benedictine monastery was founded by St Wilfrid, only to be sacked by the Vikings 200 years later. In the 11th century, the Augustinians rebuilt the church, which dominates the market town of Hexham today. Raby Castle Surrounded by a moat in 200 acres of parkland and gardens, this beautiful 14th-century castle was once the home of the powerful Nevill family and is presently the home of 11th baron of Barnard. Interiors from the 18th and 19th century give an outstanding insight into the lives of the lords and servants. Barnard Castle In its heyday, Barnard Castle was one of England’s largest castles; now it lies sadly in ruins but still remains impressive. Alnwick Castle Home to the dukes of Northumberland (whose family name is Percy), you’ve probably seen its exterior in a Harry Potter movie, or perhaps Robin Hood: Prince of Thieves. Not much has changed since the 14th century, and the interiors are as sumptuous as it gets. Dunstanburgh Castle You’ll need to park the car and walk along the coast to reach the promontory where the ruins of this castle perch 100 feet above the sea. The earl of Lancaster built the castle in 1316, while John of Gaunt enlarged it later in the century. Bamburgh Castle Since the 6th century some kind of fortress has existed on this site high above the coast. If you believe in legends, Sir Lancelot, knight of King Arthur, once owned the castle. Today you’ll find a Norman keep, one of many border towers built near the border of Scotland. In 1894, the industrialist Lord Armstrong carried out a massive reconstruction, leaving the appearance of a grand manor-castle. Newcastle It’s ironic to be a city named Newcastle when the town castle was built in the 12th century on the former site of a Roman fort. Be that as it may, only the keep and the gate of the outer fortifications have survived. Staircases and rooms display the castle’s history from a 1644 siege during the Civil War to a shelter from those fleeing German bombing in WWII. Holy Island (Lindisfarne) At low tide a causeway emerges, allowing visitors to come explore this desolated island. Home to St. Cuthbert, a monastery and great center of Christian learning existed here in the 7th century. Viking incursions in the 9th century caused the monks to flee, taking the illuminated Lindisfarne Gospels (now in the British Library) with them. A later, 11th-century priory on Holy Island, which holds a museum, may be visited, as well as the brooding 16th-century Lindisfarne Castle, now converted into a private home. Northumberland National Park Prehistoric remains and fortified houses known as bastles and peels hide away in the great wilderness (400 acres) of this national park. Beamish Open-Air Museum Set on 300 acres, this museum gives an insight into the lives of people of the North East during the Victorian era.